Villas Jasmine was designed by a leading Thai architect, under guidance from an experienced European property developer and designer. 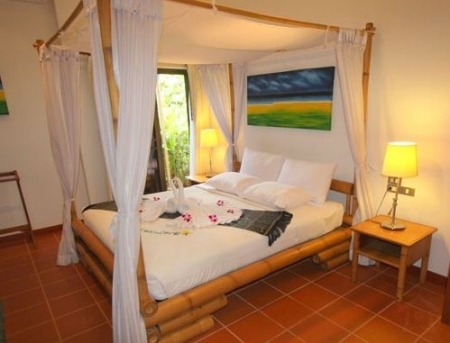 The villas were built on a west-facing gentle slope, a mile inland from Kata Beach. This allows for magnificent sunset views over the sea, through the tops of coconut trees from the terrace and infinity pool. Villa Jasmine has its own private rooftop infinity pool and sundeck. The special filtration equipment provides crystal-clear water and the pool’s powerful Jacuzzi-style water jets are positioned to allow you to view the sunset while savouring that exotic cocktail. Towels, beach towels, and luxury towelling robes are supplied and laundered during your stay. Upstairs the large, open-plan living areas look out onto the terrace and pool. In addition to a spacious lounge, there is a large formal dining area with a ten-seater bamboo dining table; four bar stools are also available at the breakfast bar. The fully-fitted European kitchen comes fitted with black granite worktops. The master bedroom has a magnificent Emperor-sized, bamboo, four-poster beds. The master-bedroom en-suite comes equipped with twin basins set in black granite, a walk-in shower and a 2 person Jacuzzi bath – ideal for relaxing in after a hard day sunbathing or exploring. My stay at Villa Jasmine during November 2012 was my second in two years. Once again, everything was outstanding. The accommodations, food, transportation, service and activities available nearby were top notch. The owner (Brian P), manager (Noi) and their entire staff are delightful to work with and extremely focused on making sure your trip is a great one. Highlights of this trip included the following: - Meals cooked by the staff were again as good if not better than food at top Thai restaurants. They also did a fine job cooking a western style dinner for us on our final evening - grilling steaks, chicken and prawns poolside. The villa is a great place for a pool party like this. - We were consistently well stocked with beverages of our choice - wine, beer, vodka, etc...whatever we asked for, they obtained it and only charged us cost as promised. This resulted in significant savings compared to going out every night. - The masseuses that Noi arranged to visit the home were very skilled and charged only a fraction of what one would spend in most other countries. - The driver, Paul, is a great guy and extremely reliable. We worked out a deal with him to provide transportation for an entire day for a very reasonable price. And when we told him we were done touring and he could simply drop us at the beach, he took extra time and effort to suggest that he take us to a nearby temple first - which was amazing to see. Most drivers would have been happy to drop us off and go home rather than spend an extra hour working despite a flat fee that we had agreed to. - Rounds of golf at Red Mountain, Phuket Country Club, Loch Palm and Blue Mountain were a pleasure. The quality of the courses and level of service at each are high - with Red Mountain being the very best (although more expensive). I'm addicted to golfing in Thailand now and can't wait to return again sometime soon. - Kata Beach is gorgeous. We finally made it there on our last day. 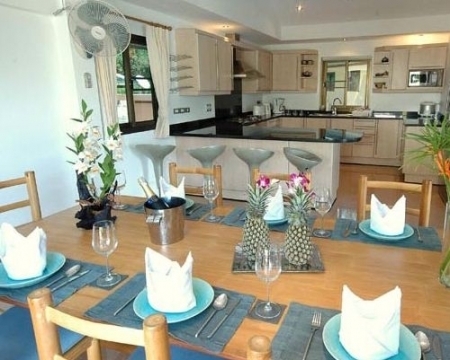 It was hard to leave the pool at the villa or take time away from golf, but if you like beaches, this is a great one to visit and only a short taxi ride or reasonable walk away. 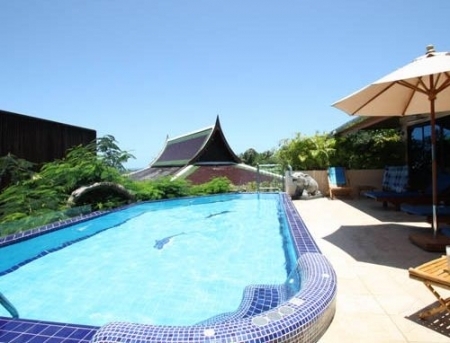 - The location of the villa is perfect to be in a central location and have access to activities all over Phuket. - If you like boating, we chartered a catamaran for a day and sailed to an island to snorkel, caught albacore tuna off the back of the boat and enjoyed lunch on the water. The pier with the boat was only a 10-15 minute ride from the villa. The clear blue waters and views of islands were spectacular to experience - and could be enjoyed for multiple days given bedrooms on the yachts and catamarans available for rent. I'm considering a combination of a few nights on the water and a week or two in the villa for my next trip. - A strong and consistent wifi signal can be obtained throughout the entire upstairs and pool area (and usually on the lower level with bedrooms as well) due to use of a new service provider and installation of a signal booster in the kitchen. While one should try not to spend too much time using electronics while on vacation in a paradise like this, sometimes access is critical and the connectivity was helpful - for maintaining contact with family, entertainment and work. Overall, I've never come away from a vacation so relaxed - even more so than my visit last year. And while I usually like to travel to new places, I can't wait to return to Villa Jasmine again!" Best regards, Brian Grossman , Chicago , USA . January 2013.